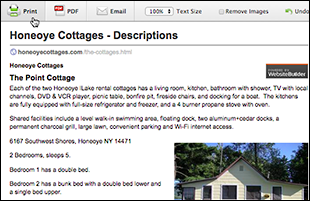 Pages created with Website Builder do not print correctly — or at all — using Microsoft Internet Explorer, Mozilla Firefox, Google Chrome, and Apple Safari web browsers. On Windows, Internet Explorer cuts off the right-side of pages. On both platforms, Firefox also cuts off the right-side of pages, while Chrome baulks and displays a "Print preview failed" error. On Macs, Safari prints blank pages. Browse to the web page created with Website Builder. 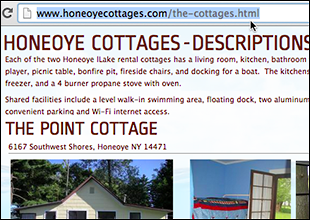 Copy its web address from the location bar. Open a second tab or window in your browser and go to: http://www.printfriendly.com. Paste the Website Builder page's address into the blank printfriendly field and click print preview. When the preview of the page appears, click the Print button (or click PDF to save it for later use). Note: The printed page's layout may not mirror the website page, but will include all its text and photos.